LEDs are easy to control using the HIGH and LOW commands, and the timing is easy to control using the PAUSE command. The GOTO command allows you to send the program back to the start or GOTO other places to execute the program nonlinearly. The FOR…NEXT loop allows you to control the number of times a program moves through its iterations. The VAR command allows you to create and store variables and using combinatorial logic you can add to these variable and by doing so see how many times a switch or sensor has been activated so you can use this information to make a decision in your program. All these code examples will be visited repeatedly and will come in useful in future programs so save all your programs as you create them. Development of a new class of LEDs is moving to devices called OLEDs, which stands for organic LEDs. This new class of LEDs will prove to be brighter and more flexible. They will be able to be as thin as paper and will consume less power as well they are easier to manufacture. In the future, we will see these in consumer products such as large scale TVs and as projection screens that, you can roll up like paper. 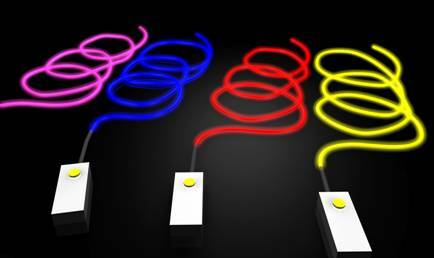 Electroluminescent wire is a wire that appears to be like a mini neon tube but is flexible. The artist Marjorie Franklin has been weaving jewelry with these electroluminescent wires. Other possible lighting sources are small neon tubes, which will run on a 9 volts battery. Light sheet is cut-able lighting source which is about twice the thickness of paper and when turned on emits a blue or green glow. Small incandescent bulbs in 5, 9 or 12 volts are possible but be careful not to try to power these or the electroluminescent wires directly from the Basic Stamp as they need more power than the outputs of your stamp can provide. However there is a circuit in chapter 11 that will allow you to control these additional devices utilizing transistors. “Basic Analog and Digital”, Student Guide, Version 2.0, Parallax Inc., 2003 Basic Analog and Digital uses LEDs to describe counting in binary, describe analog conditions, and it introduces new ways to adjust an LED’s brightness. Donald Norman, The Design of Everyday Things, pg.